"I winced. The heat radiating off of Gabriel's hands was almost too much to bear. I gritted my teeth, trying to hold on." "The room is poorly lit, which suits my purposes well. Keeping close to the shadows near the wall as I have been taught, I make my way to the stairs that lead to the second floor." I'm just curious because I know that when I write I have this habit of switching back and forth between the two. And so I wanted to know which people prefer. Do you notice when it's different? Does one seem stronger/weaker to you? If you're a writer, which one do you usually write? Tense is really weird for me. I tend NOT to realize switching if I'm writing it, but I always catch it when I'm just reading it. I tend to find myself enjoying books more when they're in the past tense. I'm not sure why, but I do. I general prefer past tense. Present tense usually throws me off guard at first, but by the end of a book, I'll usually have gotten used to it. When I write, I do tend to switch between the two without realizing it, but finally catch myself 10 pages in and fix it. I have this problem a lot when I write as well. I tend to like reading more in past tense, but I write more in present... which doesn't make sense. I agree with all of you...I tend to switch back and forth without realizing it. It isn't until I start editing my writing that I pick up on it, and then it becomes a real pain. I do prefer writing/reading in past tense, though. I prefer reading past tense. If it's well written I'll adjust to present, but it takes adjusting and isn't naturally comfortable. I prefer past tense. Present tense doesn't feel as sophisticated or like the book will hold as much depth. Also, for some reason past tense tends feels more dramatic. I prefer past tense. Present tense feels so weird and awkward. I see past tense is winning, so I must speak up for my favored tense! I prefer present tense. It feels more immediate, as if I am right there with the character and experiencing everything he or she is experiencing as it is happening. That being said, I only prefer present tense when the book is written in first person POV. I've read present tense in third person POV, and it feels creepy! I think both past and present tenses have their usage. In writing, when you are trying to choose which tense to write in, it's important to consider the story you are trying to tell and how you are putting it together. Some methods will work better than others! I even once read a book that combined past and present tense - the past tense being flashbacks within the present tense action moving forward - and it was very effective. Thanks for speaking up for present tense! I'm surprised to see how many people prefer past, when I always thought that present seemed much more "immediate" as well. I notice that I most often switch into present tense whenever I'm writing something exciting. I'm a fan of the past tense. It's just more comfortable to read and the narrator is usually omnipresent, which means that I get that much more detail and action. That isn't to say that I dislike present tense, kind of. I do feel awkward reading books in the present tense sometimes, quite often actually. It's a little outside my comfort zone. Writing wise, I generally write in the past tense if we're talking about writing a story. Otherwise, I write as I speak which can be all over the place, lol. *sigh* I hate it when people think I'm a robot. It would take a one to read those curvy letters. I usually prefer past tense, but present tense can work really well for a certain kinds of books, say an action book that needs more tension. If a book is written in present tense the reader is closer to the action so a book written this way is usually more exciting. It really depends on the situation of the book. I prefer reading in past tense because when I read the story in present tense, I feel as if there are a couple of letters missing. I think it depends on the story you're writing! If you're trying to keep somebody on the edge of their seat because you don't know what will happen - alla The Hunger Games - present is better. If you're more focused on details of the story, perhaps in a historical romance of some sort, than past might be better. I tend to favor present in my writing. Not sure why. I write in the past tense. Writing in the present tense is just...weird for me, novel-wise. I tend to prefer reading books written in th past tense. I have a brother who will not read a book if it's written in first person present tense. He can't stand it. I honestly don't really notice, but I prefer past, unless there is a reason it needs to be in present (e.g., the main character dies). In general I prefer past tense. Present tense can be effective at times, but for the most part it seems gimmicky to me. I will say, though, that when I am writing, while I stick in the past tense for the final draft, sometimes doing things in the present tense every once in a while (as long as I remember to edit it out) can freshen up how I am looking at a scene. I do it for my sake, not for a future reader. The majority of the time, I think it depends on the tone of the author. 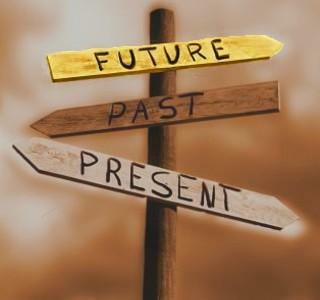 If you're going for a dream-like and "we're in the here and now" tone, then present tense. If you insert little tidbits that your character realized later in life, then past tense. I actually like present tense more. Past tense always seems forced out of me, whereas present sense seems to flow out of me. Plus, present tense seems to keep me on the edge of my seat, but past tense makes me realize that something happened between then and now that might have changed the protagonist. It really just depends on one's point of view. Present tense only works in specific situations. For example, for me, it worked in the Hunger Games (although it worked better once she was actually in the arena). Past tense almost always works. It might just be because I'm used to it, though. My stories come out in the tense that feels right. I have a story I'm trying to write in first person present tense. It helps keep the mystery of her past, because she has her memory wiped. But I also write in third person, maybe it gives the story more of a storyteller/fairy tale feel. First of all I always switch back and forth in tense when I am writing. Sometimes this is an accident, other times I do it on purpose because I just need to get a part out in a new way. Almost like a writing prompt. Point of view changes and tense shifts can help me break through blocks. As far as reading I probably prefer past tense, but present can work like some have said. It all depends on the story AND the intended audience. When I was younger present tense really worked for me. I loved to feel every moment with the characters in a book. I like both, it just depends on the story. Sometimes one works better then another. I know present tense sometimes sounds funny but other times it doesn't. Same with past tense. Sorry I'm not much help! I think you just have to experiment a bit. I think present tense is easier for me write though. Present tense seems WEAKER to me because I seem to think that authors do it just for attention, or to get readers to go 'ahhh' or whatever. Past-tense seems more classic, more traditional, and more normal. If I ever get published, I don't want my readers focusing on how I'm writing because I don't want anything to distract away from the story. Present-tense, for me, is distracting.